One of the biggest violations against Ontario agriculture and its rural communities has prompted our farm business to ask for a refund of our membership fees from Ontario Federation of Agriculture. 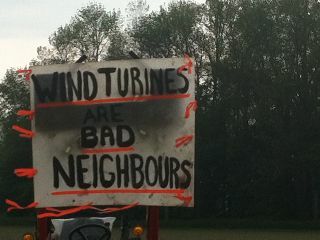 Industrial wind turbines are wreaking havoc on Rural Ontario and OFA fiddles as the countryside burns. The social, financial and agronomical impacts of these 500 ft. monstrosities demand great analysis. In January 2012, I, along with a group of 3 farmers including a 19 year old female farming enthusiast, presented our detailed concerns and impacts of industrial wind turbines to the OFA Board of Directors in Guelph. When OFA heard of the 6000 wind turbines intended for rural Ontario, the dysfunction of the communities in which they are placed, and the sacrifice of 20,000 acres of prime agricultural land, one would think that OFA would seriously investigate these negative repercussions against agriculture. To not research the topic is irresponsible. However, the Board issued some whimsical doublespeak statement and forgot about the issue, the issue that will have the greatest negative impact on agriculture, ever! I recently attended the presentation of a Health Study on Wind Turbines carried out by Dr. Hazel Lynn, the Medical Officer for Grey and Bruce Counties, during which she disclosed her finding to those counties’ Public Health Board. In the study, the researcher found that in all 18 of the observed studies of people living around industrial wind turbines, health issues of varying levels occurred in every situation. In 3 of the studies, they noted a dose response i.e. the closer to a turbine the greater the negative health occurrence. After talking with several people that day whose health remains seriously affected and knowing that some 20,000 acres of good farmland is going to waste, as well as experiencing the sacrifice of our immediate farming community to 15 wind turbines, our farm business withdraws its financial funding to OFA. Other like-minded farmers may do the same by sending a written request for refund along with your Registration Number by May 31 to: Ontario Federation of Agriculture, Ontario Agri-centre, 100 Stone Road West, Suite 206, Guelph, On., N1G 5L3. I believe our health, our farm communities and our farm land deserves greater consideration. For the largest farm organization in Ontario, to not be more concerned, is irresponsible. Posted on February 27, 2013, in Ontario Federation of Agriculture. Bookmark the permalink. Leave a comment.